My Favorite Bicep Photos - can you identify the FBB? Forum Saradas | Female BodyBuilding & Fitness & Figure - Members Area | Tastes and opinions of Saradas members | My Favorite Bicep Photos - can you identify the FBB? Here are some of my all time favorite (unmorphed) FBB biceps photos. The resolution of some is pretty poor because they were old photos and/or cropped out of larger photos. Oh well. I sure had a lot of fun compiling these and recommend you give it a try yourself. I tried to get it down to just 10, but failed. 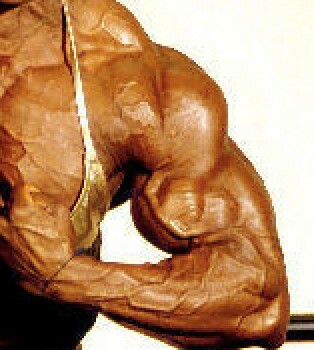 Re: My Favorite Bicep Photos - can you identify the FBB? The correct answers are as follows. 1) Tommie Moreau; 2) Iris Kyle; 3) Sheila Bleck; 4) Klaudia Larson; 5) Annie Rivieccio; 6) Johanna Dejager; 7) Renee Toney; 8- Joanna Thomas; 9) Laura Binetti; 10) Nina Loebert; 11) Charla Sedacca; 12) Christa Bauch; 13) Kristy Hawkins; 14) Pavla Brantalova; 15) Elena Seiple; 16) Marja Lehtonen. Though largely a matter of preferences, I expected someone to guess Laura Binetti because her biceps were so large and distinctive. As far as the Collette Nelson and Jen McVicar guesses go - preference again, of course, but to me, as awesome as both of them were, neither had biceps that I would consider to be in this league. Your all slipping as no one noticed several of the pics in the first post are morphed, now a couple are minor but still morphs. One is pretty obvious as the color the morpher used is off from the rest of the Biceps. I really don't know how to keep people from posting morphs as originals. The big problem is the image hosts and there stupid generated links with number 123456778xyz... crapola. That's why I always liked to have a zip/rar with the original files and names but even that doesn't always work as some morphers use the old file name. Anyway I figured people should know about the morph bit. I really don't think any of them are morphs (as I said in the original post). Why didn't you say which ones you think are morphs and provide some rational for saying that? Until you do, I/we must assume you are just flat out wrong. And in the extremely unlikely event you are able to demonstrate that any are morphed, I'll happily provide another photo of that athlete to demonstrate they belong among the best ever. If the one you thought was an obvious morph because of the color was number 1 - that is from a black and white which I probably downloaded from the old WPW site or maybe scanned from an old photo set. I admittedly colored it so it would show up better but DID NOT MORPH. Also, if you can't prove that any of these are morphed, then you owe me an apology. hey sar-net, I'm not the only one you have slighted here. even you suggest that not all of the pics I posted were morphed. (I still think none of them are.) But by failing to identify which of the athletes pics you allege are morphed, you've called all of them into question. These athletes work extremely hard to achieve theses results. Would you walk up to Kristy, or Iris, or Annie and call them fakes and phonies? I doubt it. Yet that is what you have done here. You should have to pay some price for being so dismissive, insulting, disrespectful of the beautiful, dedicated, hard-working women we are all here to admire. First off I will Apologize to Pict for not wording my post well. It was not my intent to single him out as some big scam artist Morphing pictures and plastering them up as real. Many people never even know they have downloaded a morphed/edited image. Also I should have been more clear and said morphed\edited, rather than just morphed. In truth though there are at least hundreds and more likely thousands of images on the forum that have been modified in some way that are in the woman's threads. These images seldom have any identifier as being a morphed\edited image. File names are worthless as an identifier as image hosts rename everything to some cryptic gobbledygook. Many sites edit the women's images before they are put up for view. Some may have noticed even, that some women edit their cell phone images they post on F@cebook, Inst@gram, etc. Editing\Morphing images is nothing new, in the old days actual large format photos were air brushed and then optically reduced and then printed, or a slide\negative was produced for making 8 x 10's. You can generally see the editing fairly easily by blowing up the image. One way to do it right in your browser is to use a Addin/plugin that lets you zoom the image. Now Pict has mentioned I am disrespecting the women by pointing out there are morphs/edited images in this thread. My belief is that's its disrespecting someones accomplishments building their body, for a morph to be plastered up as a real image of the woman. Now I'm not saying there is no place for morphed\edited images, just that they should be in the art section of the forum where they belong. As to my not mentioning which images were morphed\edited, I figured it was a good exercise for forum members to see and find things out for themselves (I still do.). As I said, one is real obvious if you have decent color rendition on your monitor. I still do not see ANY obviously morphed images among those I posted. I am absolutely certain that at least some of them are not morphed. Apologizing for not wording something properly is not the same as apologizing for making unfounded accusations. Since he persists in not proving his accusations, they remain unfounded. Does he accuse everyone posting photos of women here of posting morphs instead of real photos? No. But he has so accused me and his "apology" is unacceptable. And since he apparently can't prove that any (much less all) of these are morphs, he remains disrespectful of the women whose photos are not morphed (which might be all of them).